☛ In case you missed it, we’re trying out two apparel printers in our home state of Ohio. We like the style of the girly shirts, and the unisex shirts seem magnificently basic for your everyday traveler’s clothes. And the all-over-printer appears to open up some options we didn’t have before, like shoes and hoodies (Lisa Frank trusts them, so who am I to question one of my childhood heroes, amiright?). The things from these printers are on sale right now while we test, so grab ‘em brave warrior and let us know what you think! ☛ Been sending out some test newsletters! *meep* I get nervous every time I hit send. But we’re getting a good idea of how it works now and have some cool ideas for later. ☛ Emails that come from the site when you order (like your receipt and download notification) are now all shiny & matchy-matchy! We wanted to make sure our communication was super clear, and we’d been slacking on that a bit, but it’s done now. 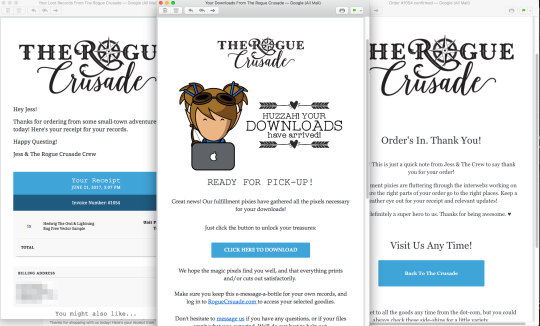 UPDATED Guide To Rogue Crusade Etsy File Updates! Now 100% Shinier! Being Forced To Take A Vacation. . .